MIT researchers have developed a new production method in creating quantum dots that can control its size and shape, and also vastly improves the quantum dot's emission efficiency. This allows the development of energy efficient and precise devices such as computer screens and biomedical kits and applications. In simple terms, quantum dots are nano-scale semiconductors that converts light into energy. These are parts of matter whose excitons (photons absorbed by a semiconductor) are bound in all three spatial dimensions. They are so small that quantum dots can be applied to most substrates or surfaces by spraying it on to form a layer of nano-film semiconductors. Quantum dots are just a few atoms thick making it viable for use in nano-sized or micro-sized devices. Currently, some transistors, LEDs (Light emitting diodes), solar panels, and diode lasers utilize this technology. Some are even looking at quantum dots for use in quantum computers. Quantum dots — tiny particles that emit light in a dazzling array of glowing colors — have the potential for many applications, but have faced a series of hurdles to improved performance. But an MIT team says that it has succeeded in overcoming all these obstacles at once, while earlier efforts have only been able to tackle them one or a few at a time. Quantum dots — in this case, a specific type called colloidal quantum dots — are tiny particles of semiconductor material that are so small that their properties differ from those of the bulk material: They are governed in part by the laws of quantum mechanics that describe how atoms and subatomic particles behave. When illuminated with ultraviolet light, the dots fluoresce brightly in a range of colors, determined by the sizes of the particles. First discovered in the 1980s, these materials have been the focus of intense research because of their potential to provide significant advantages in a wide variety of optical applications, but their actual usage has been limited by several factors. Now, research published this week in the journal Nature Materials by MIT chemistry postdoc Ou Chen, Moungi Bawendi, the Lester Wolfe Professor of Chemistry, and several others raises the prospect that these limiting factors can all be overcome. The new process developed by the MIT team produces quantum dots with four important qualities: uniform sizes and shapes; bright emissions, producing close to 100 percent emission efficiency; a very narrow peak of emissions, meaning that the colors emitted by the particles can be precisely controlled; and an elimination of a tendency to blink on and off, which limited the usefulness of earlier quantum-dot applications. For example, one potential application of great interest to researchers is as a substitute for conventional fluorescent dyes used in medical tests and research. Quantum dots could have several advantages over dyes — including the ability to label many kinds of cells and tissues in different colors because of their ability to produce such narrow, precise color variations. But the blinking effect has hindered their use: In fast-moving biological processes, you can sometimes lose track of a single molecule when its attached quantum dot blinks off. Previous attempts to address one quantum-dot problem tended to make others worse, Chen says. For example, in order to suppress the blinking effect, particles were made with thick shells, but this eliminated some of the advantages of their small size. The small size of these new dots is important for potential biological applications, Bawendi explains. “[Our] dots are roughly the size of a protein molecule,” he says. If you want to tag something in a biological system, he says, the tag has got to be small enough so that it doesn’t overwhelm the sample or interfere significantly with its behavior. Quantum dots are also seen as potentially useful in creating energy-efficient computer and television screens. While such displays have been produced with existing quantum-dot technology, their performance could be enhanced through the use of dots with precisely controlled colors and higher efficiency. 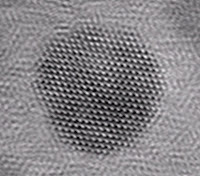 The new particles were made with a core of semiconductor material (cadmium selenide) and thin shells of a different semiconductor (cadmium sulfide). They demonstrated very high emission efficiency (97 percent) as well as small, uniform size and narrow emission peaks. Blinking was strongly suppressed, meaning the dots stay “on” 94 percent of the time. The slow growth should make it easy to scale up to large production volumes, he says, because it makes it easier to use large containers without losing control over the ultimate sizes of the particles. Chen expects that the first useful applications of this technology could begin to appear within two years. In addition to Chen and Bawendi, the team included seven other MIT students and postdocs and two researchers from Massachusetts General Hospital and Harvard Medical School. The work was supported by the National Institutes of Health, the Army Research Office through MIT’s Institute for Soldier Nanotechnologies, and by the National Science Foundation through the Collaborative Research in Chemistry Program.